Glass beads - Shanti Leprahilfe Dortmund e.V. It's hard to believe what fine artwork can come from the hands of leprosy sufferers! Bead by bead are threaded to make a cord or chain. Fine stitching – delicate bead decorations on a scarf. Or on an elegant mobile phone bag. It's always a happy time at the bead artists' table! Rainbow-hued chains can be made by threading sparkling, coloured glass beads. Flat strands of beads can be affixed to a band. Or perhaps a lovely lacing border for a scarf or mobile phone bag. 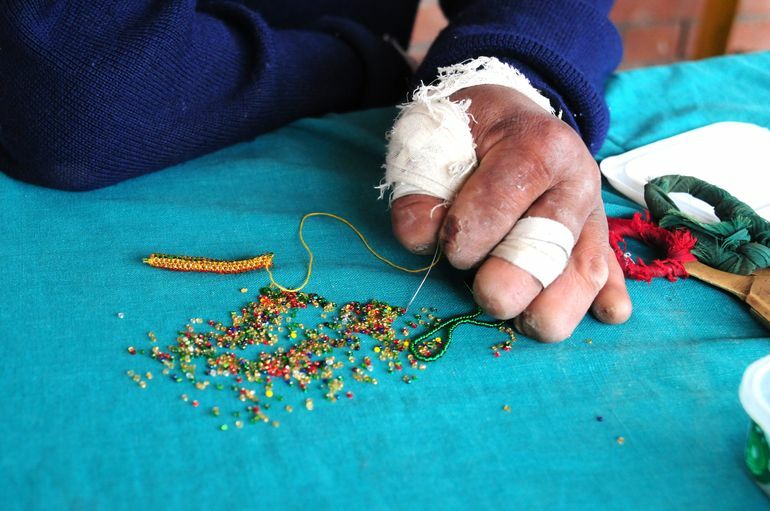 All this is created by hard-working Shanti hands, primarily with paraplegics as well as those marred by leprosy. For example, leprosy has caused Manoj to have entire fingers amputated. Nevertheless, he is one of the most skill bead artists. One can only be amazed! The beadwork usually takes place on the rooftop terrace of the Hape Kerkeling Clinic, under the protected area where the roof extends so that no one gets wet when it rains. You can hear the happy chat and laughter through the entire stairwell. Shanti patients also enjoy it, and many come up on their own to look over the bead artists' shoulders or to chat with them.